Your basic needs are taken care of with traditional Goan hospitality and modern centrally air-conditioned comfort, so you get time to attend to more urgent matters. We've even kept your convenience in mind which is why we are located not just in the heart of Panjim, Goa's Capital, but near the waterfront. 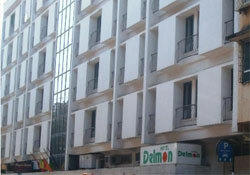 Since Hotel Delmon is located in the heart of Panjim, it makes sense using it as a base for any kind of trip. Close to commercial blocks, banks, the Secretariat, you're never far away from your work. And of course, you're also close to shopping malls, theatres, the Mandovi River, the famous Miramar and Dona Paula beaches. On offer is a choice of 50 air-conditioned and tastefully decorated rooms with all the modern amenities you will need to make staying a pleasure as well.